1. FIREWORK DISPLAYS: We all know that firework shows are wonderful to watch with their spectacle of colors. We also know that they are loud, and for most people this is okay. However for pets the loud bangs and sudden flashes can cause extreme anxiety and stress. This can lead to hyperventilation, vomiting, and panic attacks. We recommend that pets be left home during Independence Day parades and firework shows, safely away from the noise and crowds. 2. 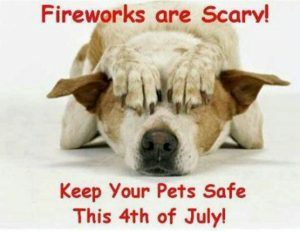 FIREWORKS AT HOME: Keep all animals away from fireworks. Besides being frightened by the loud noise, curious pets can easily be burned if they get too close. 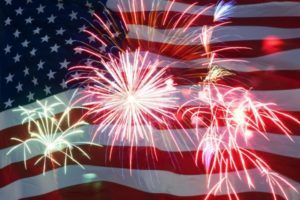 Furthermore, fireworks contain caustic materials that when ingested can be fatal. Keep pets inside while operating fireworks. 3. LIGHTER FLUID, MATCHES AND CITRONELLA CANDLES: All of these products if ingested would cause stomach irritation, blood poisoning, and could also prove fatal. Ensure that these products are kept out of reach of your pets. 4. SUNSCREEN/INSECT REPELLANT: Do not use human products on animals. They can cause skin irritation and even burns. Make sure any products you use on your pet specifically indicate that they are pet safe. 5. ALCOHOLIC BEVERAGES: During a BBQ it is hard to keep all beverages out of reach of your animals. People knock them over, set them down, or leave them behind, and curious pets can get into them. When pets consume alcoholic beverages they can easily get alcohol poisoning. Excessive consumption can cause a pet to go into a coma or even cause respiratory failure. Please monitor your pets and be aware of what they may be getting into. If this becomes too much of a hassle then move the pet inside, onto a lead, or into a pen where they can be contained and remain safe. With a little caution and awareness, keeping everyone safe this July 4th can easily be achieved. Plan ahead and be willing to monitor your pets, and your guests, during the festivities. 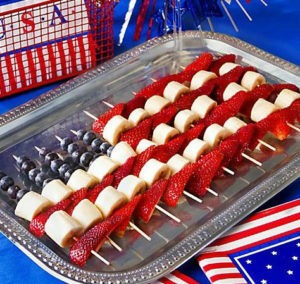 Enjoy your holiday, and have a happy Independence Day!